Bunbury has been revealed as one of Western Australia’s Lotto hotspots after it was announced locals have pocketed almost $8 million in Division 1 prize money across the last five years. With nine Division 1 wins to its name, the lucky streak has continued into 2018 after the town produced the State’s first Division 1 winning ticket worth almost $600,000 in January. Did you know that every time you purchase a Lotterywest games the majority of the funds go back to the people of Western Australia through prizes and community funding? In the last five years alone, The State Government through Lotterywest has been able to provide 139 grants totalling almost $6 million to Bunbury through our grants program. Almost $600,000 to the City of Bunbury towards the Koombana Bay foreshore playground. An $830,000 contribution towards stage two of the South West Regional Wellness Centre. Almost $30,000 towards the South West Catchment Council’s waterway health awareness initiatives. Over $8,000 towards equipment to support the Crewsaders Dragons Abreast Bunbury Inc. breast cancer survivors’ activities. It’s only thanks to our players and local retailers we’re able to support the things that make Bunbury unique. Your next chance to make a SUPER contribution to your local community is in the $20 million March Superdraw! Players have until 6.00pm on Saturday 24 March 2018 to purchase tickets for the Superdraw in-store, through the Lotterywest membership online or via the app. Read more about where the money goes here. Want to find out more about Lotterywest grants and its impact in the community? 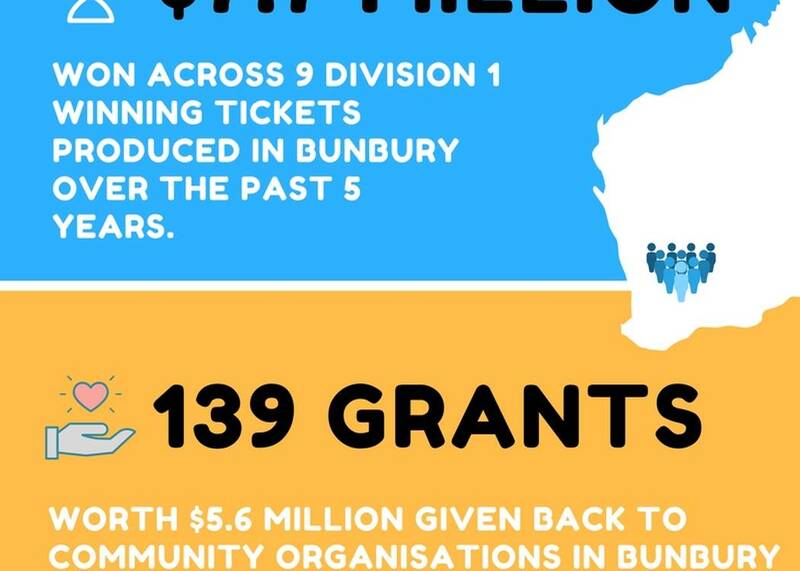 The Lotterywest team will be visiting Bunbury for a Grants Information Clinic on Thursday 15 March. Contact Senior Grants Management Officer Adam Williams on 9488 6690 or adam.williams@lotterywest.wa.gov.au for more information.